U.S. motor gasoline product supplied, a proxy for gasoline use in the United States, has been rising after reaching an 11-year low in 2012. Although lower gasoline prices have been an important factor in the increase in gasoline use so far in 2015, changes in the labor market and in the vehicle sales mix over the past few years also have contributed to the rise in gasoline use. Because more than 90% of U.S. motor gasoline is used in light-duty vehicles (LDVs), factors that affect vehicle miles traveled (VMT) and the average fuel economy of the LDV fleet can also lead to changes in gasoline consumption. In addition to lower gasoline prices, a stronger U.S. job market and higher wage growth may have contributed to record-high VMT, and sales trends in the automotive market indicate that U.S. consumers are purchasing more vehicles that have lower fuel economy ratings. The U.S. Department of Labor's Bureau of Labor Statistics publishes the Job Openings and Labor Turnover Survey, which provides data on labor availability, such as the number of people hired and the number of jobs left unfilled (job openings) each month. The spread between the number of hires and the number of job openings is one way to measure the strength of the job market. 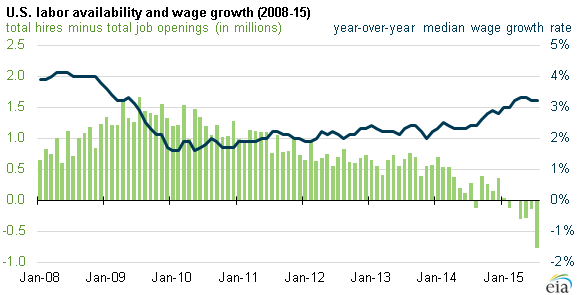 Since the start of 2014, the gap between the number of hires and the number of job openings has declined. Starting in February 2015, the number of job openings has consistently exceeded the number of hires, reaching nearly 800,000 in July, signaling a tighter labor market where competition has increased to find qualified candidates. Wages appear to be rising in response to the tighter labor market. Data from the Federal Reserve Bank of Atlanta for year-over-year median wage growth show that, in the fall of 2014, median wages began to grow at a faster rate than they had been in the four years since the end of the recession. In April and May 2015, median wages grew 3.3%, the highest rate since May 2009, before ticking down to 3.2% in June and July 2015. Some of the increase in gasoline consumption may reflect more driving by U.S. consumers as employment levels and purchasing power improve. Note: Data for 2015 reflect seasonally adjusted monthly values through August. In addition to rising VMT in response to both employment growth and lower prices, changes in the fuel economy of the U.S. LDV fleet can also affect gasoline consumption, particularly over a longer horizon. Vehicle sales data from the U.S. Department of Commerce's Bureau of Economic Analysis show that from January through August of 2015, sales of light-duty trucks—pickup trucks, sport utility vehicles, and vans—outpaced those of passenger cars by a seasonally adjusted 28%, the highest difference on record. Light-duty truck sales, on an absolute basis, have been increasing steadily since 2009 and, from January to August 2015, averaged a record 9.57 million at a seasonally adjusted annual rate. Even though fuel efficiency for light-duty trucks and passenger cars has increased because of fuel economy regulations, light-duty trucks have lower fuel efficiency on average than passenger cars. Over a longer period, the differences in fuel economy can increase gasoline consumption as trucks make up a higher percentage of the nation's LDV fleet.